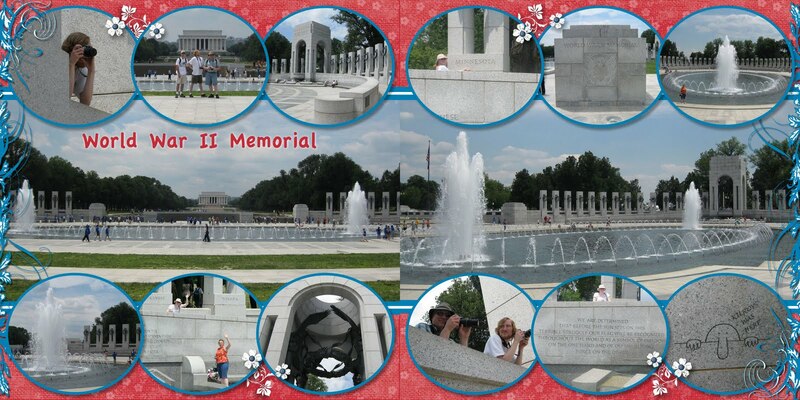 Here is the next page I've created for my Washington D.C. album. No real fancy tricks with this one, just a fun layout. I love how big you can make the pictures in MDS. When I do traditional scrapbooking I find that I rarely use pictures any size other than 4x6... but here I was able to make them the entire width of the page. It really helps to draw the attention to the "main attraction" of the beautiful water fountains at the WWII Memorial. Since I don't have any cool tricks today I will at least make up for it by posting another layout. I find that searching layouts is always helpful anyways... that way you don't always have to reinvent the wheel to create a scrapbook page. Instead, you just have to find a wheel that will fit. So, without further ado, here is the Korean War Memorial. 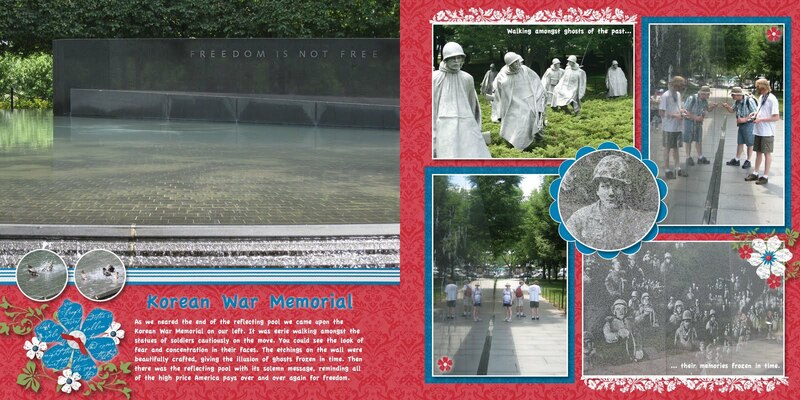 Once again I used a large picture to highlight the memorial pool. I also added to little tiny round cute pictures as an accent. I had a lot of fun on this page creating the bunches of flowers... embellishments like that always look better in groupings. Well, I hope you've enjoyed these fun pages, cause I really like them! Check back later to see how the rest of our trip went.